We all love our hair, don't we? If you follow me on Instagram, then you’d probably know that I recently got my hair cropped up. The reason you’d ask; it’s because of heavy hair fall since monsoon. I know monsoon is responsible for taking toll onto the hair but then it was too overwhelming for me to not worry about my tresses. And as those quirky advertisements tell “I tried this shampoo & that product and yet nothing worked for me”! Ironically, instead of finding some miraculous products, I came across legit bummer ones which claimed to work as a shield against hair fall but instead caused hell lot more hair fall than I already had. In short, worst experience ever! This is why, I began my research on brands that are devoid of chemicals and do show some results. I mean if not like a complete transition catered to my hair, at least stoppage of hairfall would do. Before going further, let me pause to describe you my hair type and major concern with them. I have thin-fine straight hair which grease up on the scalp on the next day of hair wash itself. My major concern for hair is volume and bounce. Also, a lot of moisture based shampoos and conditioners make my hair go limp which is why I steer away from usual Dove Shampoos (No offence. It's just not suited for my hair). I have had tried Inatur products in past but those were mainly from their skincare range. But since I dealt with no side effects or skin troubles with their products, I thought why not try their hair care range too. Initially I was gonna pick their Moroccan Argan Oil Shampoo & Conditioner variant but they were meant for dry hair seeking nourishment and shine. So, I ended up choosing their Tahitian Monoi Oil variant. So without more delays, let’s begin with how their Shampoo and Conditioner duo fared for my hair. Inatur stands for the best combination of scientific innovation and nature. Their brand symbolizes the blessings of Mother Nature and the protective cover that it cocoons us in. 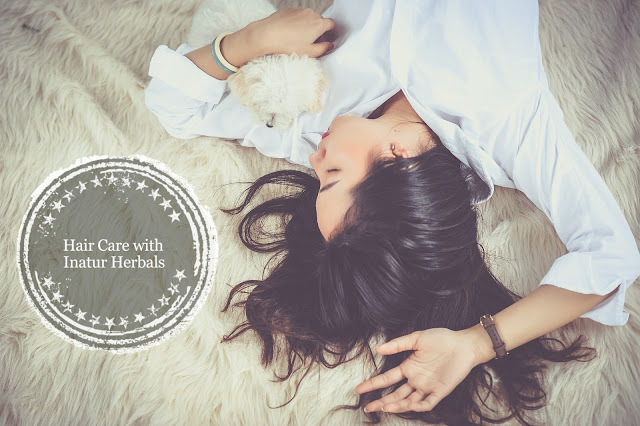 They employ their knowledge of Ayurveda and bring affordable products within the market because they believe that everyone deserves to look and feel beautiful in their own special manner. 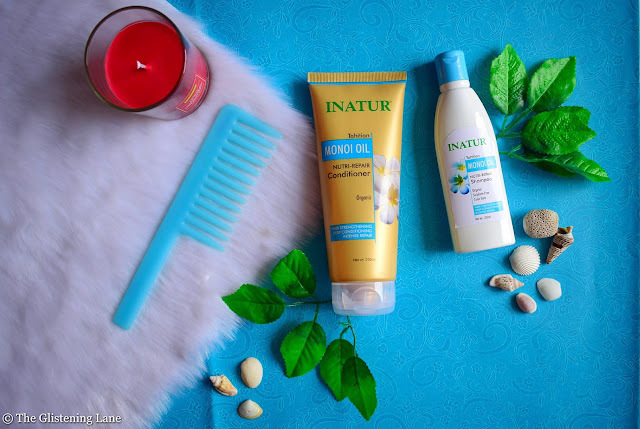 Inatur gives you beauty remedies that fit into your budget. Monoi Oil Nutri Repair Treatment Shampoo is a gentle & mild cleanser that is free from sulphates, parabens, silicones, phthalates or other harmful synthetics. Pump Monoi Oil Nutri Repair Shampoo on to the palm. 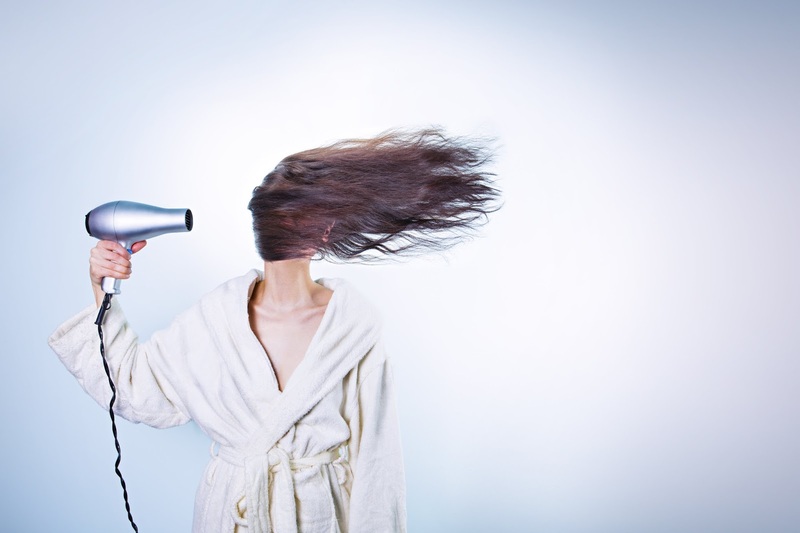 Work the shampoo gently down to the ends of your hair and rinse thoroughly. Repeat if neeed. The one I’ve got comes in a white plastic bottle with blue flip open lid. All required information is in depth, given within the labeling itself. I think they have a larger bottle too which comes with a pump dispenser; I think I saw those in one of Inatur’s blogger events. Since the bottle is of plastic, it’s not fragile and you can easily travel with it because of its compact structure. I've tried various shampoos to detect what would go well for my thin hair since excessive dry ends would make my tresses look super messy and untamed. Although, I do like a little messy look for slight volume and bounce but then I don't wanna neglect the damage that it caters to my hair shaft. Also, a little shine harms no one. But usually, products which provide shine, are endowed with chemicals like silicone. Silicone based hair care or hair styling products do provide that instant shine and jazz to your hair but the problem remains that silicone merely gives a false finish of shine which dies out as soon as you again wash your hair. 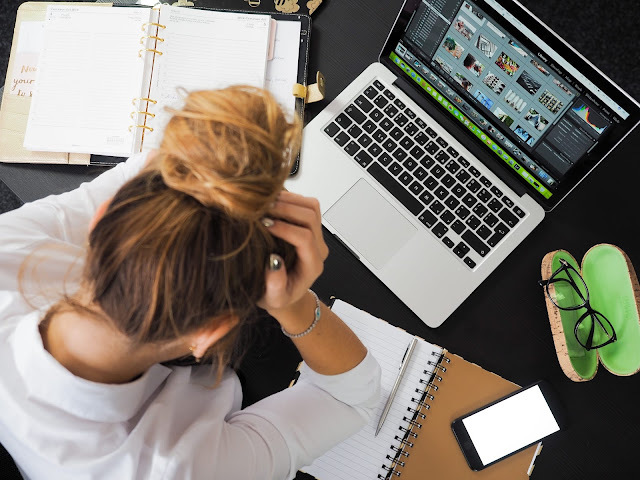 In simple terms, it merely creates an illusion that you have healthy hair while in real, things are quite damaged internally. It's like what foundation or concealer does to your face, giving you a blemish free even toned skin but you know underneath there's a pretty unpleasant pimple awaiting to transfer acne causing bacteria to more places. 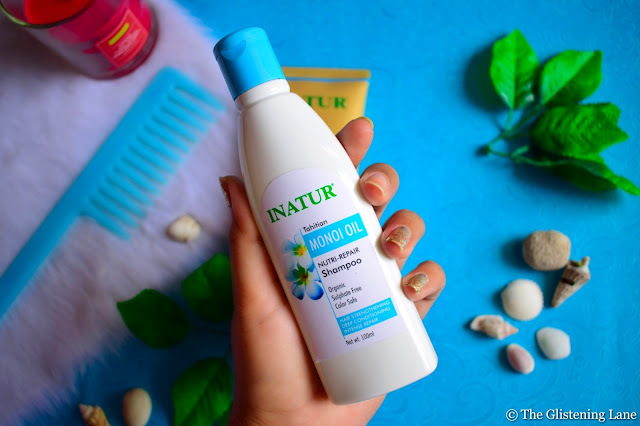 What I loved about Inatur's Tahitian Monoi Oil Nutri Repair Shampoo is its mild potency which makes it perfect for usage on an everyday basis. Thus, it does not strip off your hair from its natural moisture/oils. And since we undergo a lot of pollution each day, not hair on an everyday basis is hardly feasible. You can of course resort to dry shampoo but then I don't kow if using it on an everyday basis is good for scalp or not. P.s. you can use Johnson's Baby Powder for a quick fix of oil parting on your scalp. In case you don't know, this shampoo is free from parabens and other harmful chemicals. It is even safe for colored hair. Since this cleanser is sulphate free, it doesn't lather too much like usual shampoos, but just a little to provide good cleansing. It provides very slight hydration to the hair, thankfully not leaving them feeling limp and volume-less. One thing I want to mention, when I picked this shampoo, I was little sceptical. The reason being, the term "Monoi Oil". As I told you before, moisturizing shampoo are a strict no-no for me, so the term oil made me wonder if this would make my hair look limp. But that was not the case with this shampoo. The fragrance of this shampoo is really appealing; it's somewhat herbal yet sweet. The color of the shampoo isn't completely white and it's more of a translucent white. The consistency is a little onto the liquidy side and flip top lid makes it easy for taking out the shampoo into the palm. since this shampoo is mild, you don't need to mix it with water in a mug; and it can be applied directly onto the scalp and hair. I've noticed that it does keep hair look fresh and oil free for somewhat one day complete and another half day, i.e. 1.5 days. After which you will see sebum onto your hair scalp. I have an oily scalp so that's how it fared for me. Monoi Oil Nutri Repair Conditioner contains a blend of tiara flowers, coconut oil, wheat protein extract and peppermint oil to strengthen the hair. It repairs dry and damaged hair. Regular usage of this product prevents hair breakage by reducing protein loss from hair. It is beneficial for brittle, damages and frizzy hair. Dampen your hair with tepid (lukewarm) water and apply Monoi Nutri Repair conditioner, Leave it for a few minutes, then rinse. Apply every time you shampoo your hair. Aqua, Monoi Oil, Coconut Oil, Sodium Cocoamphoacetate, Glycerine, Lauryl Glucoside, Sodium Cocoyl Glutamate, Sodium Lauryl Glucose Carboxylate, Hydroxyethyl Urea, Honey Extract, Wheat Protein, Maltooligasoyl Glucoside, Cetearyl Alcohol, Cetereth 20, Peppermint Oil, Phenoxyethanol. I don’t know if it’s only me or not but I like my conditioners in squeeze out tubes. Inatur’s Tahitian Monoi Oil Nutri Repair Conditioner too comes in an easy tube packaging of golden colour with blue highlighted labels. It is definitely travel friendly and not vulnerable to break on falling from height. To be honest, I’m not really a conditioner person. Almost every time, I ditch my conditioner. The reason being, some of them make my hair go *Bleh*! And when I occasionally do pick a conditioner for an elaborate bath, I use it before I actually cleanse my hair with a shampoo. This way I cleanse away excess conditioning too. So my hair remains soft and shiny within that neglect of volume. I already have straight hair therefore conditioner usage for entangling hair isn’t what I feel the need for. 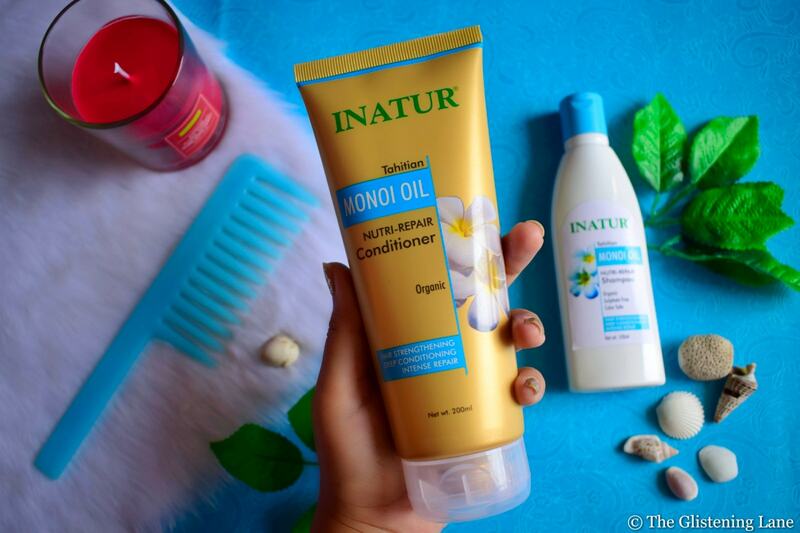 With Inatur’s Tahitian Monoi Nutri Repair Shampoo, I tried this both before shampoo and after shampoo and this didn’t give me limp hair. It provided subtle hydration and the most amazing part is – this has peppermint oil. While applying, I do smell that peppermint fragrance and it leave slight cooling sensation onto the head. I apply it onto my ends and not the scalp. Since it’s not highly moisturizing (as it’s made keeping concerns of thin hair in mind), I like to apply it and keep it for more than 2 minutes. While cleansing off the conditioner, you do feel that it has smoothened your hair a little. Similar to the shampoo, fragrance of this is amazingly sweet too! The consistency of this is thicker than the shampoo. It does provide shine but that’s not too blinding, it’s kind of minute. But of course you know you don’t wanna achieve those prettier exterior of hair with no real goodness endowed inside. Today, almost everyone is conscious about what they eat and what products are used by them on an everyday basis. But due to lack of proper knowledge on ingredient lists, we either pick up a wrong brand or the brand merely ends up claiming to be all natural and good but in reality, things are worse! The reason being, a lot of the brands do not publish/ disclose their complete ingredient list. And since Indian laws aren't rigid about this, there's a big loophole! I've even come across brands which give excuses like "there was not enough space on the packaging to disclose all ingredients". Or the excuse would be "a lot of the big India brands also just disclose key ingredients". So, make sure to see the ingredient list before picking up any product. If it seems super short and fancy then chances are, its a deceit set outright for you. For a product to be formed, just an amalgamation of Neem, Tulsi & other stuff wouldn't do because there's a gel like consistency within which you see the product. Sodium Lauroyl Sarcosinate - Sodium Lauroyl Sarcosinate is usually confused with Sodium Lauryl Sulphate which also abbreviates to SLS. Now Sodium Lauryl Sulphate is regarded as supremely surfactant and thus products with this produce a lot of foam like your detergents. But Sodium Lauroyl Sarcosinate's potency is completely mild and this is why I felt that this cleanser did not produce foam in abundance and is labeled as a 'mild cleanser'. And of course, you can use it on an everyday basis. Coco Glucoside - Coco Glucoside is regarded as quite mild in nature and it is one those cleansing agents which are subtle in their cleansing properties, suitable best for sensitive skin/scalp. It is produced using coconut based fatty alcohol and glucose/sugar. It does not strip your hair with its natural moisturizers and leaves the hair soft. Guar Hydroxypropyl Trimonium Chloride - This is obtained from Guar Gum which is derived from Guar Beans. Guar Hydroxylpropyl Trimonium works to cater conditioning properties. Some brands incorporate silicone which is nothing but polymer or in simple terms synthetic plastic. While Silicone merely coats your hair to give that shiny polished effect, within the longer run, it is harmful and does no benefit to your hair. So, a natural substitute of the same which you'd find in natural hair cleansers is Guar Hydroxypropyl Trimonium Chloride. So apparently, the shampoo & conditioner contains Dmdm Hydantoin. DMDMH is actually permissible and the limit of it is 1%. Since the percentage of the same within the Tahitial Monoi Oil Nutri Repair Shampoo and Conditioner is merely 0.1 & 0.2 percent respectively; so you don't need to worry! Goodbye Hair Woes with Satthwa Premium Hair Oil!